Pretty cool, huh? Yeah, that’s right. Creative Condition team mates Dom Smith and Jonathan Sillence (alongside Team Fandangmo mates Anthony Neylon and Dan Chapman) raised a total of £147 this Movember. Individually, Jonathan deserves a special mention for his raising £40.33 on his own personal profile, with Dom raising £23.33. All details at the links. Movember’s not just for men. The women of Movember, are known as Mo Sistas. They play a vital role in the success of Movember by supporting and encouraging the men in their life to get involved. Mo Sistas also get involved by signing up at Movember.com, and participate by raising funds and awareness themselves. 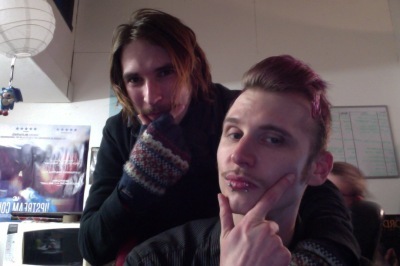 Essentially, Mo Sistas do everything that Mo Bros do, without a Mo. More about Mo Sistas here. At the end of the month, Mo Bros and Mo Sistas celebrate their Movember journey by throwing their own Movember parties or attending one of the official Gala Partés held around the world.